Caroline J. Lualdi, 96, formerly from Herrin, passed away Tuesday, April 17, 2018 at Meadowbrook Manor in Naperville, IL. Caroline was a hairdresser, a homemaker, wonderful wife and mother. She was known for her beautifully crafted crocheted afghans, baby blankets and dolls. 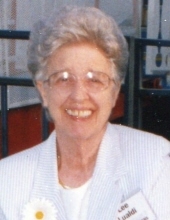 She was a member of Our Lady of Mt. Carmel Catholic Church in Herrin. Caroline was born November 14, 1921 in Herrin to Mike & Louisa (Mirani) Venegoni. She married Louis A. Lualdi on January 21, 1947 at Our Lady of Mt. Carmel Catholic Church. He preceded her in death in 1999. Caroline is survived by her daughter, Brenda Lualdi of Downers Grove, IL; and cousin Marianne Marlo of Durham, NC. A Rite of Christian Burial will be held 10:00 a.m. Wednesday, June 6, 2018 at Our lady of Mt. Carmel Catholic Church in Herrin with Fr. Joseph Brown officiating. Visitation will be 9:00 a.m. until 10:00 a.m. Wednesday, June 6, 2018 in the Gathering Space of Our Lady of Mt. Carmel Catholic Church. Interment will be in San Carlo Cemetery in Herrin, IL. Memorial donations can be made to OLMC New School Fund, 314 West Monroe Street, Herrin, IL 62948; envelopes will be available at the church. To send flowers or a remembrance gift to the family of Caroline J Lualdi, please visit our Tribute Store. "Email Address" would like to share the life celebration of Caroline J Lualdi. Click on the "link" to go to share a favorite memory or leave a condolence message for the family.